Welcome to the official website of the Embassy of the People's Republic of China. As a splendid and ancient civilization, Indonesia is hailed as the "emerald on the equator". In recent years, Indonesia has enjoyed political and social stability, continuous economic growth and constant improvement of people's livelihood. Indonesia also plays an increasingly important role in both regional and international arenas. As friendly neighbors across the sea, China and Indonesia enjoy long-lasting friendship between the two peoples. 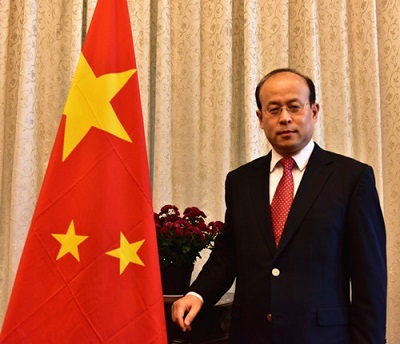 Since the establishment of comprehensive strategic partnership in 2013, under the strong leadership of both countries, bilateral relations between China and Indonesia have sustained sound and steady development, featuring increasingly frequent high-level engagements and fruitful cooperation in various areas. China has now become Indonesia's largest trading partner and largest source of foreign tourists. As China has entered a new era, the China-Indonesia relationship is presented with new opportunities. My colleagues and I are ready to work with friends from all circles of Indonesia to enhance aligning of development strategies, strengthen and expand bilateral practical cooperation, promote people-to-people exchanges, and elevate the comprehensive strategic partnership between China and Indonesia to a new height. I sincerely hope this website would serve as a window for better understanding of China and of China-Indonesia relations, and a bridge to promote friendship and cooperation between the two countries. Thank you for your interest and support and look forward to your insights and suggestions.